A deficiency in riboflavin promotes the activity of pro-inflammatory compounds, which creates an environment favorable for the onset of diseases. In the absence of this B-complex vitamin, the generation of reactive oxygen species goes high, which damages the healthy cells and increases the risk of various diseases and disorders. Riboflavin plays a crucial role in the production of energy. Research has found that insufficiency of riboflavin significantly down regulates expression of enzymes involved in the break-down of carbohydrates, proteins and fat into energy. Hence, it becomes difficult to convert the food you eat into energy. Riboflavin is required by the body for wound healing, but this action is delayed in the absence of riboflavin. Insufficiency of riboflavin slows down the rate of wound contraction and delays wound healing. Research has found that riboflavin plays a vital role in maintaining the level of collagen, a skin protein. Collagen helps in tissue growth and hastens wound repair. A deficiency of riboflavin has been observed in children with type 2 diabetes as compared to healthy children. Oxidative stress plays a pathogenic role in the onset of diabetic complications. In the absence of riboflavin, the level of natural antioxidants in the body goes down and thus, the body is unable to fight oxidative stress. Riboflavin has a neuro-protective potential, which prevents or delays Parkinson’s disease. Deficiency of riboflavin has a huge negative impact on neurological health. This B-complex vitamin protects the brain cells against free radical attack and inflammation and thus, it prevents death of brain cells. As human brain is highly susceptible to oxidative damage, it requires natural antioxidants to fight against it. Riboflavin enhances the production of antioxidants in the body that protect the brain. 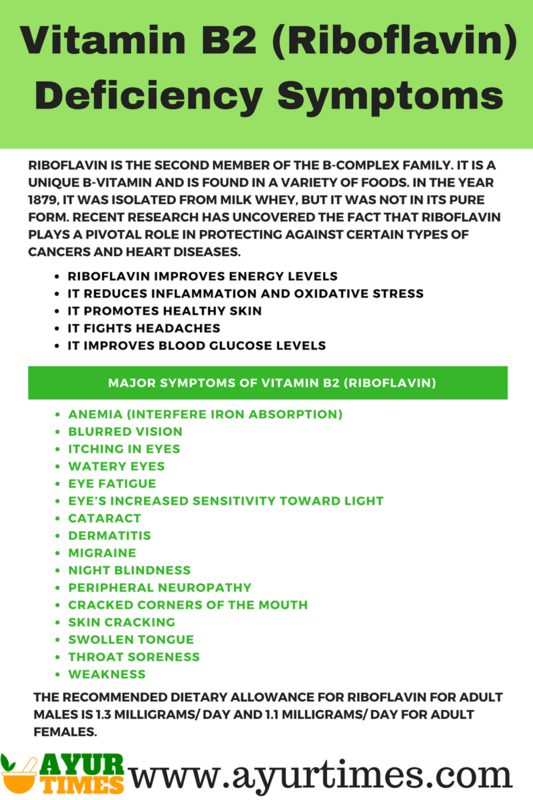 Moreover, riboflavin inhibits the release of inflammatory compounds and protects the brain cells against destruction. It has been shown that riboflavin is beneficial for individuals with migraine headaches. Riboflavin reduces the severity, duration and intensity of migraine attacks. A high level of homocysteine in the blood is associated with migraine headaches. Riboflavin reduces migraine attacks by lowering the level of homocysteine.